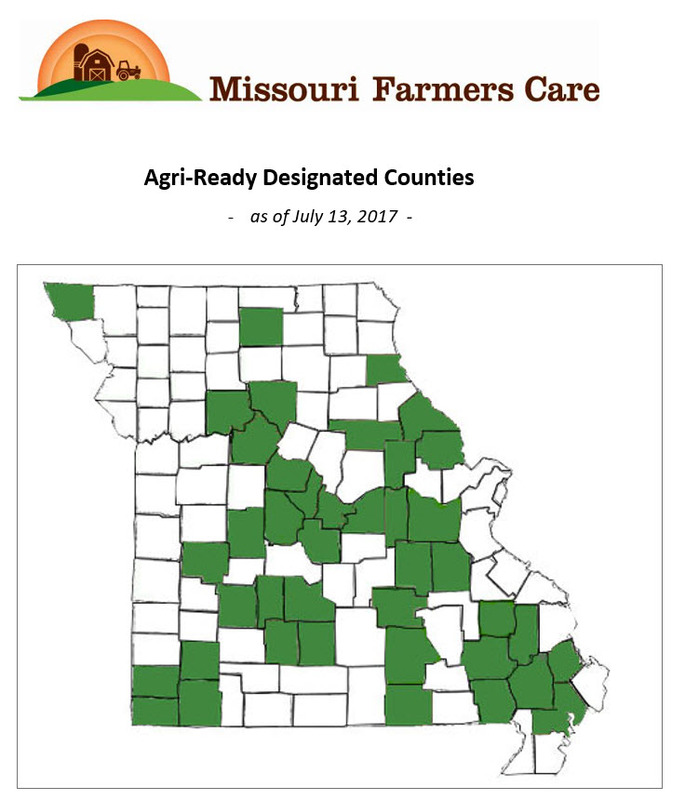 Welcoming economic growth and supporting local agriculture production, Montgomery County has applied for and achieved Agri-Ready County Designation by Missouri Farmers Care (MFC), a coalition of 45 leading Missouri agricultural groups. This designation identifies counties that create an environment conducive to agricultural opportunity and growth which are willing to actively support Missouri’s largest industry. Agriculture is already an important force in the Montgomery County economy. In 2016, the county’s 795 farm and ranch families and agribusinesses sold over $413.7 million in agricultural products. Agriculture, forestry and other related industries provided 1,552 local jobs, according to the recently released Missouri Department of Agriculture (MDA) Economic Contributions of Agriculture and Forestry Study. The county’s agricultural strength is anchored in the value of soybeans, crop input sales, beef cattle, and hogs. Montgomery County joins Atchison, Audrain, Barry, Benton, Bollinger, Butler, Carroll, Chariton, Cole, Cooper, Crawford, Dallas, Dent, Gasconade, Laclede, Lawrence, Lincoln, Marion, Moniteau, New Madrid, Newton, Oregon, Osage, Pike, Saline, Scott, St. Clair, Stoddard, Washington, Wayne, Webster and Wright counties in achieving Agri-Ready Designation. Counties wishing to apply for Agri-Ready designation must meet program requirements, including no ordinances regulating agriculture more stringent than state law and support of agricultural stewardship, growth, and opportunities. 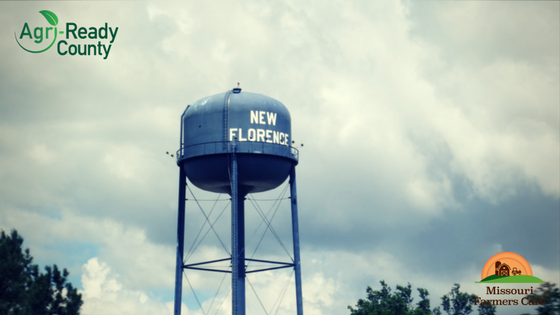 After an application is received from the county commission, the MFC Agri-Ready Review Committee examines any local ordinances, regulations, and statements of support prior to awarding designation. 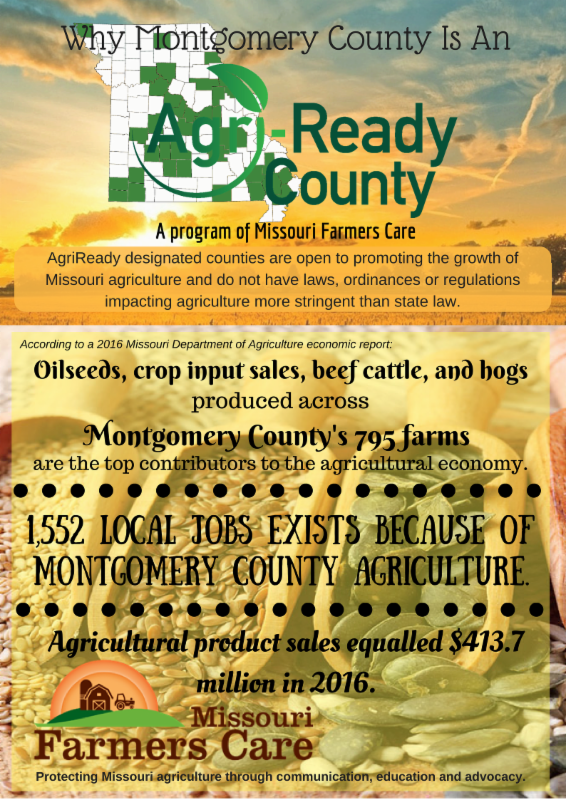 For more information, view the 2016 Economic Contributions of Agriculture and Forestry in Montgomery County presented by the Missouri Department of Agriculture, Missouri Farm Bureau and Missouri Agricultural and Small Business Development Authority.